In “Praise and Worship with Flags” Delores asks the question why did the Holy Spirit take control and move the streamer in her hand? The book points the reader to the flags’ biblical truth. The book takes the reader on a journey to discover this truth with Scripture, knowledge, and testimonies of healing and victory. While we are in the supernatural fight with our enemy Satan it is important to know who we are in relation to God. We need to know that we have God’s Holy Spirit power available to us in order to defeat our enemy. Do you know who you are? You are “an alien and stranger in this world”, “a member of God’s household”, “a fellow citizen with God’s people”, “a part of God’s whole family in heaven and earth”, “the apple of God’s eye”. Who can ascend the holy hill to get into God’s presence? “He who has clean hands and a pure heart.” How do we become clean? Be washed by the Word. When we are washed by the Word, we are definitely washed by the two greatest commandments, the love commandments. Love is the major cleansing ingredient. We are seeking to get into the presence of God. It is crucial to know what love is. Present day use of flags is grounded in Old Testament scriptures. Declare ye among the nations, and publish, and “raise a flag”; publish and conceal not: say, Babylon is taken! One of God’s names is Jehovah Tsebaoth, Lord of the Heavenly Armies. When the enemy comes, we are to pray. Our Lord as Jehovah Tsebaoth goes before us and fights our enemy in the spirit realm. “When the enemy shall come in like a flood the Spirit of the Lord shall raise a standard against him.” That is supernatural or spiritual warfare. It happened in Biblical times. It happens today. Delores gives examples of how to use the flags in spiritual warfare. She also gives testimonies of healing due to the flags under the power of the Holy Spirit. Delores gives a practical exercise on how the reader may get closer to God during worship. The most important things you must first do are confess your sin, repent from sin, and humble yourself before God. Turn on a worship song. As you listen to the song focus on the words. Let the words you hear jar your heart and memory of all the attributes you know about our Lord from scripture or experience. Think about these attributes. Wave the flags to the beat of the music while thanking and talking to God about His attributes. Verbally talk to God with heartfelt gratitude. The book sends two messages to Church leaders. First, flags have a Biblical role and purpose in the Church. Second, the teaching in this book may spiritually grow members’ worship experience. 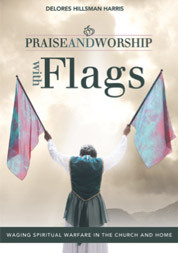 “Praise and Worship with Flags” may be used as a teaching tool.